Our example truck is a 2015 Chevy Silverado 1500 Crew Cab with a 5.8 ft bed and the 5.3 V8. If your truck has different specs, even the bed length, some of the Chevy Silverado upgrades you need may vary. But we can help with that. We have a full team of expert, American techs in the office to help answer your questions so you can find the exact parts you need the first time. Give us a call at 877.787.8989, chat with us live (M-F 8am-6pm CST), or just drop your question in the comments section below. When Chevy (or any other manufacturer) designs a vehicle, especially a mass appeal vehicle like the Silverado, they have to compromise between several factors. One of them is a compromise between power and what they would call “noise,” but what we gearheads call “induction sound” or “the V8’s sweet, sweet woodwind section.” Because Chevy knows that all the boring people driving these cars won’t want to hear that music, preferring instead to listen to vapid Top 40 hits or breezy talk radio. So they muffle that sound, the sound of air being sucked into the engine right before it’s converted to awesomeness, and this muffling hampers horsepower. Since these efforts to quiet induction sound result in more resistance for the air, it slows down and warms up. Your engine thrives on fuel, but also on air. If you can shove more air into your engine, you can, in principle, get more power. Cold air is also denser than warm air. So the colder the air going into your engine, and the less resistance it has to face on the way in, the more power you can get. A cold air intake, as you may have guessed by now, does just that. It gets more air into your engine and you get to hear all of that glorious intake music. There are no downsides for us. We recommend this excellent Cool Air Intake from Volant. 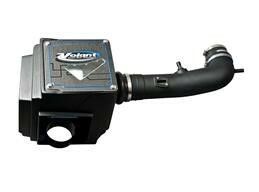 Starting with their synthetic Powercore filter, Volant added a high-flow intake tube leading back to the throttle body. They then completely enclosed the filter in an independent air box which will only channel in cool air from outside the vehicle, rather than warm air that’s already been circling and heating in the engine bay. Buy a Volant Air Intake, get $25 back. The result is a huge gain of a reported 12 hp and 15 lb-ft of torque. That’s not an easy number to just pull out of nowhere. Engineers search for years to find an extra 12 horsepower. All you have to do is bolt up a cold air intake. You can probably have it done in half an hour. It comes with remarkably little maintenance. The Powercore filter requires no oiling or cleaning, and only has to be replaced every 100,000 miles. What else can we do to that V8 to free up more power that’s already there? We’ve handled the air going in, but what about the exhaust going out? Everything we just discussed about induction sound is multiplied when it comes to exhaust sound. Car manufacturers restrict exhaust flow to muffle sound. 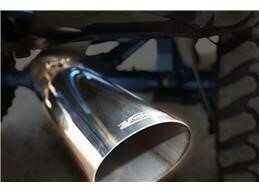 They know that a quieter, tamer exhaust will appeal to more potential buyers. After all, who wants an aggressive, powerful exhaust note howling away behind his or her truck? You do, that’s who. This is a big, Chevy V8, here. There are few more glorious sounds on earth. You can let it sing. And as a reward, you’ll get more horsepower and torque. When flow is restricted, like it is in your stock exhaust, your engine has to work harder to shove the exhaust out. That’s less power it can send to the wheels. Open that up with a cat-back exhaust system like this aggressive, balanced kit from Volant, and you’ll get that power back. The system offers a drone-free experience, so you don’t have a loud, annoying resonance within the cab, but outside, they’ll definitely hear you coming. The cool thing is, installing this cat-back system takes little more effort than installing a cold air intake. Sure, you have to crawl under your truck for a bit, but it requires no welding. Everything bolts right up, so you can have it installed in an afternoon. This is a single, side-exit system made of 3,” heavy gauge stainless, with a 4,” polished stainless tip. It carries a limited lifetime warranty and won’t rust. And Volant made it right here in America. Buy a Volant Exhaust, get $75 back with this SSA Exclusive Offer! So we have air in and exhaust out, but what about fuel? If you get too much air without enough fuel, your mixture will run lean and you’ll lose power. A cold air intake by itself won’t cause this, since the Silverado’s fuel injection system can automatically adjust for it. But now that you have all that air coming into your engine (and an open door for the exhaust flowing out), you have potential. If you do add more fuel, you’ll have all the air you need for a good mix and more power. The question is, simply, how do you get that extra fuel? You have to hack the computer. Your Silverado’s ECU determines how much fuel the injectors spray out, and you have to tell the computer that it needs more. You can do this with the Hypertech Max Energy power programmer. Just plug the Max Energy into your truck’s OBDII port, follow the on-screen instructions, and in moments you’ll have an extra 13 hp and 15 lb-ft of torque over stock. So why didn’t Chevy just do this from the factory? Were they scared? Or lazy? No. It just goes back to what the average, boring customer wants: a nice, slow, tame, predictable vehicle. They also have gas mileage concerns to worry about. They have to balance out performance with MPGs, or government regulators will drone them. Thankfully, government regulators (probably) won’t drone you for installing the Max Energy. In fact, you won’t even necessarily lose fuel efficiency. The Max Energy works by changing your fuel maps, digital charts in your Silverado’s ECU that let your injection system know how much fuel to use depending on several factors, including how far the pedal is depressed. Basically, that means the power is there when you put your foot down, but you won’t be burning more fuel than stock every moment your truck is running. A little more power never hurt anyone. Not even your warranty. The Max Energy saves your system settings and can easily switch your truck back to stock whenever you need to take it to the dealership. But all that power will be worthless if you go off road and your truck isn’t ready for it. The Silverado’s stock suspension package offers a ride height that works pretty well on the road, if you’re towing or commuting, but if you start plowing through deep mud or snow, or over huge ruts, you’ll probably want something a little higher off the ground. And if we’re honest, lifted trucks just look cooler, anyway. 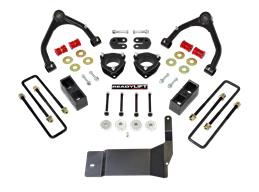 This killer 4″ lift kit from Readylift will take care of you. Using strut supports and lift blocks, it provides an extra 4″ of lift up front and 1.75″ out back. This won’t, however, have your rear end sagging like your bed is an elephant taxi. The rear of a truck is lighter than the front, being without an engine and such, so raising the front will essentially raise the rear, as well. You’ll be left with a level truck, much higher off the ground. That means you can fit bigger wheels and tires. With this kit in place, you can bolt up tires as big as 33 x 11.50 with a 5.25″ backspaced wheel. Readylift didn’t mess around with this kit, either. They scrutinized and tested to make every element as tough as possible. Readylift even bought some of the first of this generation of Silverado when they rolled off the line in 2013, so they could begin engineering right away. The ball joints on those control arms, for instance, are ported over from the much heavier Silverado 2500 HD kit, so they’ll be able to stand up to heavy duty punishment. Poly bushings need to be greased periodically, or they’ll start to squeak. But Readylift included grease fittings right in the control arms, so you can grease them regularly without having to rip the whole system apart. What would have taken all day takes 5 minutes. The skid plate is powder-coated for extra rust protection. Even the diff drop spacers are billet milled for extra reliability. Finally, we’re going to talk about a slow part. But it’s still very powerful. Your stock battery is what’s known as a starting battery. It’s only designed to turn the starter, and then immediately charge up whenever the truck is running. This is fine, unless you have some things you want to power when your engine is off. The lights we covered earlier this month can come in handy at a work site or a bonfire, but you don’t want to let your truck idle all night. Maybe you have a nice stereo or CB you’d like to leave on. A starting battery will power all of these things for a little while, not as long as you’d like. Plus, once you deeply discharge a battery like this several times, you could ruin it. 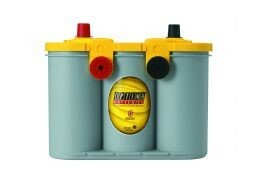 The solution is a deep cycle battery, which is designed to be deeply discharged regularly, and the very best deep cycle battery on the market is the Optima Yellow Top. Optima’s batteries are quite different from conventional, lead-acid batteries. Rather than submerging lead wafers in acid, Optima uses an array called AGM, or Absorbed Glass Matt. This consists of several spools of fiberglass and gel. The result is far more stable, and longer lasting, than old, lead-acid batteries. Optimas have been known to last as long as ten years. They also perform better in the deep cold and high heat, where many batteries, with their water-acid solutions, would destabilize. We can safely say that this is the best deep-cycle battery you can get for your Silverado. We spent this month adding Chevy Silverado accessories to make your truck comfortable, protected, practical, and now, finally, fun. Most of these mods you can install yourself with few tools and no expertise. So change your truck from somewhere you need to be into somewhere you want to be. Get started today. Happy modding! What are your favorite Silverado performance parts?